Former name of Stanton. 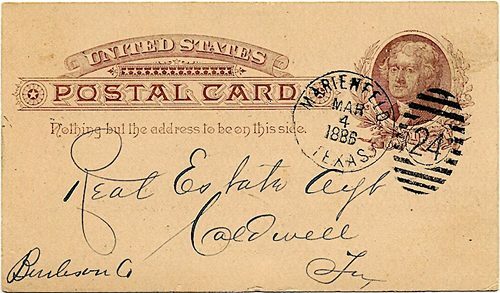 Begun as German colony by 5 German Catholics from Kansas, who pitched tents here, near new Texas & Pacific Railroad in 1881. The site -- with a water tank, section house, telegraph office bore name Grelton, but settlers had it changed to Marienfeld, German for "Field of Mary." County was created 1876 and named for Wylie Martin, senator in Republic of Texas. When the county organized, town became county seat. First commissioners court met here December 13, 1884. Through Protestant influence, town was renamed Stanton, 1870. 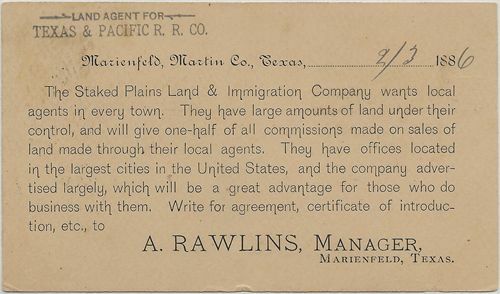 The back of the postal card, showing an ad by the Staked Plains Land & Immigration Company.